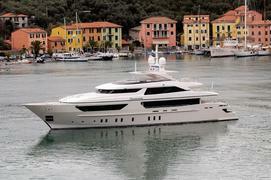 Italian builder Sanlorenzo has launched the first of its flagship 44 Steel range. The 44m displacement tri-deck yacht features a steel hull with an aluminium superstructure, and its exterior styling has been developed as an evolution to the SD92 and SD122 semi-displacement models. Internal volume has been optimised at 499GT – right below the 500GT classification threshold – and the resulting interior volume means there has been space not only to create generous living areas, but also to include both a large beach club in the stern with gymnasium, and a tank deck that offers a near-full- height stem to stern service tunnel complete with laundry and extra fridge and freezer capacity. The 44 Steel is powered by twin CAT 3512B diesels producing 1,500kW each, which in turn drives the yacht to a top speed of 17 knots while giving cruising speed of around 15 knots. A 4,000 mile, transatlantic range should be possible at a slightly more economical speed of 12 knots.